Yella IS the New Black!!!!! Pierre Laubert was already on site and it was wonderful to see him. Before relocating to the Left Coast Peter was core part of the NYC scene and remains one of the Reliable One’s BFF’s. That he asked me to sub in for an absent partner at Chipper’s tourney was a real honor and is a cherished memory. The aforementioned Mr. Meier was there of course, as were Bradford T., The Oracle, Fresh, Chuck, JB, Emma (for her Last Jam before heading home), The Ageless Trevor Brown, Rob, TedShred and TLC. Trevor and I started out the day by tossing a sweet A*T Styler at distance. This allowed us both to loosen up while getting in some Jammin’ at the same time. Fresh and Rob got up and were joined briefly by Peter who has been battling some health challenges. While his throws remain awesome and he added plenty to the goings on, he demurred after a bit to make certain not to overdo it. The Old School pairing soldiered on, and then were joined by Joey after a few minutes. Around that time Forever Trevor and I decided to bring it in and start to Jam in earnest. This was fortunate timing because a certain gentleman who was escorted onto the field by an extraordinarily beautiful woman bearing tasty beverages had just arrived. 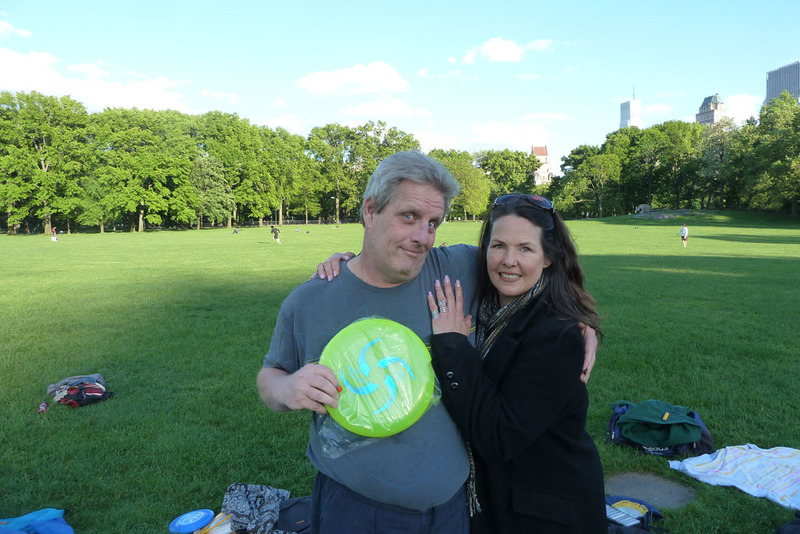 He was looking for a bit of Freestyle Frolicking and The Lovely Chrissy took a moment to present Pierre with his very own Board Certified All*Star Thursday disc. Hot Plastic and Hot Babe–Life is Good! My ability to take notes on other Jams ended Mr. Oberhaus arrived. He, Forever Trevor, and I anchored a Mash-up Marathon that pretty much everyone on hand got a piece of, at one time or another. Given my Double Yella status, I was thrilled to be able to participate in what became the Jam of the Day. Trevor played incredibly well, raising not only his level of play but also the standard by which all of us should strive for in terms of fitness and health. To be 72 and Shredding this seriously what I am aspiring to. I do recall Fresh joining the fray, as did Bradford T. and The Oracle at various times. It was a load of fun. I did break for a few minutes when I saw a cat wearing a Downtown Brown Ultimate shirt. I had received on as a gift and had to see who it was. It turns out that it was Isaiah “Izzy” Bryant in the dopest long-sleeved T and ever saw, and Nick Judson of the Connecticut Constitution of the The American Ultimate Disc League (AUDL). Plastic Peeps throughout the world should be thrilled that this venture has finally emerged. Highlights from AUDL games made the ESPN Top Ten Plays two nights in a row, and were featured as Top Trends on Yahoo too. They asked if it would be possible for the Tribe to come to a game and perhaps do a demo. I am looking forward to making that happen because supporting other disciplines is a form of Spreading the Jam in the Spirit of the Game. What’s not to like? I finished chatting and went back to finish the evening the way it started. Jammin’ with Trevor and Teddy. It really doesn’t get much better than that. Now all we need is YOU!!!!! 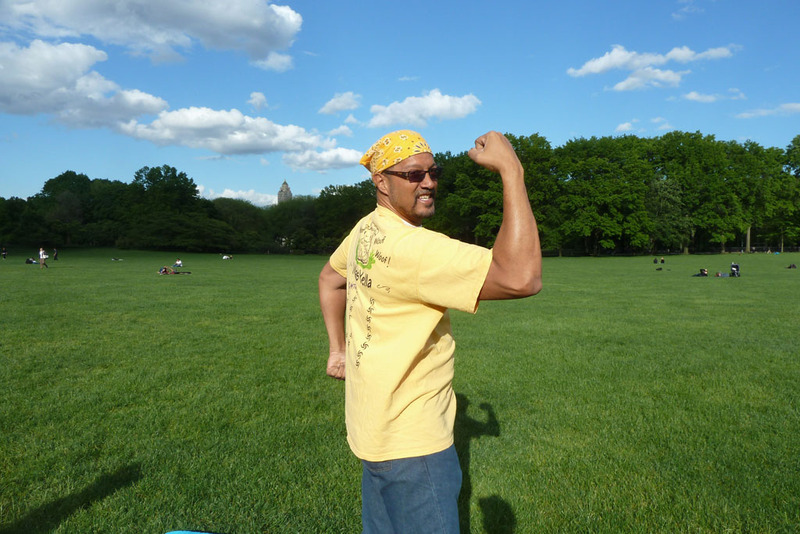 This entry was posted in A*T Chronicles - 2012, Guest Jammer Initiative Jams and tagged Freestyle, Frisbee, New York, Sheep's Meadow, sports. Bookmark the permalink.